Revise Your Design For Life. by creating a design for life that is more aligned with life as you imagined. What happens when your design for life just doesn't work out the way you hoped? "Why didn't my intentioned design for life work out like I have planned?" "Why am I sitting in this precise, stuck position at this precise time in my life? "It seems like I've played by the rules. but why haven't I been able to accomplish them? What is that makes it seem like my dreams can't be reached? You have to face this reality: your design for life and your dreams of a well-designed life are realizable...as long as they are grounded in the realities of life. and it happens with or without your permission. Fact 2: Some life happenings are beyond your control. 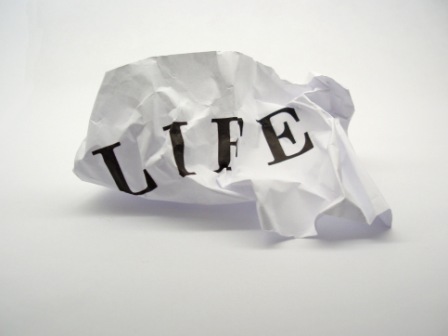 Some of life happenings occur as a result of things that you can't control. then you must examine each of your life's components for what they really are. You must evaluate each component to determine whether that component has any real value in your design for life. During those times of re-assessment it's critically imperative that you evaluate the assumptions under which you are living your life. Over the last seven years the United States and beyond has drastically changed. These shifts range from global competition to a fundamental shift in the demographic infrastructure to the economic realities that impact employment opportunities. And now, more than ever before, you have to stop how well your design for life fits within the current realities of the world at large. This is because your life reality is no longer influenced by the girl or guy sitting right next to you, or by your immediate community of family and friends. Your life reality encompasses a huge surge of unknowns. These unknowns are factors that span far greater than what's going on in your backyard or in your own community. Thus, it is time that you assess who it is that you really are: what is your true value to the world? What is it that your soul is screaming that you offer the world? Oftentimes, we stay stuck because for whatever reason we are hiding who it is that we really are from ourselves, our friends, our families, and even the world at large. This is because we are trying to live up to something that THEY have told us that we need to live up to. The missing element, however, is that during these past few years you have also changed. You have evolved to a much wiser, more evolved you. And it's that more evolved you that will have to take control of your life right now, and challenge your preconceived notions that are inherent in your previous design for life. It's time for that more evolved you to stand up and give voice what it is that you have been placed on this Earth to do. When reassessing your design for life, you will need to allow the more evolved you to give an answer to what it is that you will do that will define who you are in life. Look at your life for what it is. Weed out all of those components in your design for life that no longer work for you. Then replace each of those unhealthy components with perceptions and actions that are grounded in the context of your current reality. Understand your true reality and then create a design for your life that delivers the magic that you desire. Read More Below to Find a Design For Your Life that Will Deliver the Magic That You Are Searching For. Breaking Through Blocks. People Fail in Life Because They Get Stuck and Stay Stuck...Time To Break Through Those Blocks. "Am I Using All Of Me?" What to Do When You Feel That Something Is Missing In Your Career Or Life? What Is the Secret To Living Your Life Fully? Finding A Career or Business That Fits. Discover a Career Fit Survey Or Assessment To Find That Career That Fits.